The Silver Creek Fire Department is teaming up with other fire departments across the United States during Fire Prevention Week, October 7-13, 2012, to urge residents to "Have Two Ways Out!" This year’s theme focuses on the importance of fire escape planning and practice. 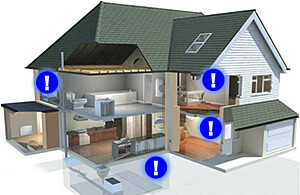 According to the National Fire Protection Association, one home structure fire was reported every 85 seconds in 2010. Having a tried and true escape plan with two ways out is essential to ensuring your family’s safety should fire break out in your home. Choose a meeting place outside in front of your home. This is where everyone can meet once they’ve escaped. Draw a picture of your outside meeting place on your escape plan. Sound the smoke alarm and practice your escape plan with everyone living in your home. Keep your escape plan on the refrigerator and remind your family to practice the plan twice a year.